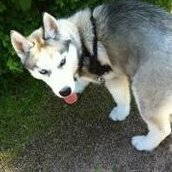 patch 7.9 has early access UK DDs fo T5-T8. Full UK DD line is out Oct 17th on patch 7.10. This is the patch where we can get lucky and get blueprints for the Tier V, IV, VII or VIII if we're lucky, like with the French BBs. Same here. Gave us a mission that only U.K. DD's can be used but we do not see them. really frustrating. If you have Gallant, you can use that. Or any of the early access UK DD. 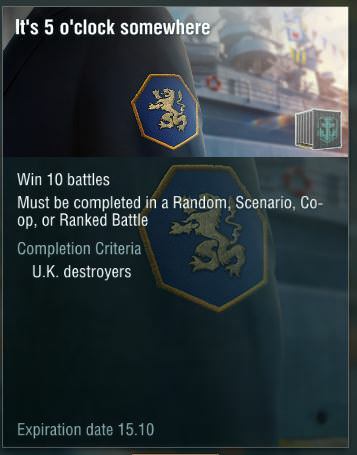 The RN event runs until early morning Dec 10th and you can get UK DDs on patch 7.10 on Oct 17th for the last 2/3 of the event. You do not have to do the UK DD Missions to complete the Directives. Still packed in crates (only if you are lucky). Reading comprehension a little OP? If you read the news correctly you would notice that they said you would have a CHANCE to earn EARLY access to some of the British DDs through missions. And at T3 coal price it's just a jump to the left..... then a step to the right. The first Directive doesn't have any 10 win Missions. This mission is separate from the Directive Missions. Campbelltown is T3. The RN event is T5+. So only Gallant and the early access missions UK DDs work this patch. And Cossack if it goes on sale in the shop or if they have Guinea bundle packages on Fri.
Next patch, 7.10 on Oct 17th, ALL the UK DDs will be released.